Crossings #2. 2018. Oil pastel, charcoal, pigment and pencil on Fabriano paper. 41 1/8" x 29"
Cut Loose #4. 2017. Oil pastel, charcoal and pencil on Fabriano paper. 29" x 22"
Cut Loose #1. 2017. #2 pencil on Fabriano paper. 30" x 22"
Crossings #4. 2018. Oil, pastel, graphite, #2 pencil, oil and pigment on Fabriano. 29" x 22 1/2"
“. . . great tactile beauty” . 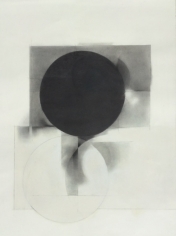 . .
Anita Rogers Gallery is pleased to announce Gloria Ortiz-Hernández: Drawings and Sculptures, on view at 15 Greene Street from October 10 - November 10, 2018. “There is no ‘story’ in this work, no reliance on nature, no human figure. The source is from within. Each gesture, each mark, has to be sought, each form to be discovered. Through unwavering attention, the artist begins to see, to abandon familiar notions, to accept—without hindrance and free of prejudice—the image as it comes. Because doubt is always present and false starts happen, the work is made slowly. While the attention of the artist is tightly engaged with the emerging purpose of the drawing, the materials speak as well. Materials help establish the image, they give it form and, in doing so, afford substance to the feeling and speak for it. Fine powdered materials such as pigment and charcoal delight when they ‘fly’ and fall on to the paper, suggesting their own displacement. The density and creamy consistency of oil pastel, on the other hand, demands absolute meticulousness because both during and after application it remains wet and slippery. The pencil, a frank and simple instrument, is capable of creating complex, deep, and dark tones that surprise and instruct. It is an irreplaceable instrument. Colombian-born Ortiz-Hernández's drawings and sculptures have been shown in numerous solo and group exhibitions. Her work is in the permanent collections of a number of institutions, including The Museum of Modern Art (NY), The Fogg Art Museum at Harvard University (MA), Art Museums Cambridge (MA), The Morgan Library and Museum (NY), The Menil Drawing Institute and Study Center (TX), and The Museum of Fine Arts, Boston (MA). Her work is also in private collections throughout the United States and in Basel, Switzerland; Sao Paolo, Brazil; and Bogotá, Colombia. Holly Hager highlights Gloria Ortiz-Hernández's Crossings #1 in Curatious's newsletter this week.